Shall we admire these amazing beautiful covers? Top Ten Tuesday is an original meme hosted by the lovely people over at the Broke and the Bookish. Hey guys, it's Amy! I've just recently taken a look at some of the TTT topics for the next couple of months, and a bunch of them look absolutely amazing, so you can expect to see … Continue reading Shall we admire these amazing beautiful covers? Hiya there, how you doing? It's Top Ten Tuesday again, and the topic is books we've enjoyed that have less than 2,000 ratings on Goodreads. Now, I did something somewhat similar last week with my Top Ten Tuesday, talking about two authors who don't get enough attention considering how good their books are, so those … Continue reading These books may not be on the best-selling list, but I love them anyway! Hey guys! This week's Top Ten Tuesday is a freebie, so I decided to one from the past- July 16, 2013, to be specific! I'm only doing two this time, so you know what that means- I'm going to talk. A lot! Top Ten Tuesday is a weekly bookish meme hosted by The Broke and … Continue reading These lesser known authors wrote books that will blow your mind! Top Ten Tuesday is a weekly bookish meme hosted by The Broke and the Bookish. In order from most loved on down (considering the fact that I've really not read that many books published this year), I present to you... Top Five Favorite 2016 Releases So Far This Year 1) A Court of Mist and … Continue reading These are, for sure, my top 5 books published this year! I need to read these books RIGHT NOW! Hello again! 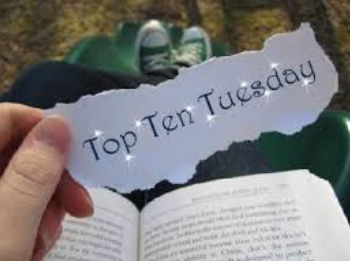 It's Tuesday again, and you know what that means- it's time for Top Ten Tuesday! Top Ten Tuesday is a weekly bookish meme hosted by The Broke and the Bookish. Top Ten Most Anticipated Releases For The Second Half Of The Year (Whoops- a little note, I didn't see the releases bit. Looks … Continue reading I need to read these books RIGHT NOW! For the first time in forever… A Top Ten Tuesday! Hey guys! I don't usually do Top Ten Tuesdays anymore, but I saw Jocelyn @ 52 Letters in the Alphabet do one that looked really fun, so I decided to check out the topics! It looks to me like I'll probably be doing them for the majority of June and the very beginning of July. … Continue reading For the first time in forever… A Top Ten Tuesday! COME ONE COME ALL!!! I have something completely awesome that I need to share with every single one of you! Hello everyone! It's Amy again, unfortunately Nikki is super busy so she won't be sharing in the fun this week. Okay, take your minute to cry... Have you sobbed long and hard yet? No? Well, hurry up then! I'm on a tight schedule! Okay, good. Now that all the crying is out of the way, … Continue reading COME ONE COME ALL!!! I have something completely awesome that I need to share with every single one of you!